Ocean Master (Orm Marius) is a fictional supervillain and in some cases an antihero appearing in comic books published by DC Comics. Created by Bob Haney and Nick Cardy, the character first appeared in Aquaman #29 (September 1966). He is an enemy of his half-brother Arthur Curry, otherwise known as Aquaman, and is commonly depicted as an adversary of the Justice League, the superhero team that his brother is a founding member of. Textless cover of Aquaman #14 (January 2013). Art by Ivan Reis, Joe Prado, and Rod Reis. The character has been substantially adapted from the comics into various forms of media, including the Justice League cartoon television series, the animated movie Justice League: Throne of Atlantis, and several DC-related video games. Ocean Master made his live-action debut in the 2018 DC Extended Universe film Aquaman, portrayed by actor Patrick Wilson. In his subsequent appearances Ocean Master, believing Aquaman was afraid of him, had decided to overthrow Aquaman and usurp his throne. Unable to survive underwater, he made a special costume and helmet to help him breathe while in the ocean and clashed with Aquaman many times. Ocean Master regained his memory when Deadman took possession of his body and unlocked Orm's memories in Aquaman #50 (March–April 1970), but he continued to plot against his half-brother. He first appeared in #3 of the miniseries Aquaman: Time and Tide (February 1994), in which Aquaman recorded the story of his life. This told how one of his early encounters with humans was when he rescued a girl named Kako from a polar bear. Her family were all traditionalists, except her cousin Orm, who had no time for the old ways. When Kako and Orin/Arthur (the future Aquaman) began a sexual relationship, Orm attacked her in a jealous rage. Although she survived, she did not recall what had happened to her. Orm was last seen having used his mystical talents to alter reality so that he was Aquaman and Orin was Ocean Master, using a spell with the bones of Aquaman's lost hand as a focus. As Aquaman, Orm held Sub Diego under his evil rule, restricting the city's growth by claiming that the surface world had been destroyed by the attack that sunk the city. However, Arthur was able to defeat his brother's plot thanks to Doctor Geist- the scientist who had turned Sub Diego's population into water-breathers, who had studied Aquaman extensively and was unaffected by the spell as Orm didn't know he even existed, Geist providing Arthur with enough details of the real world to find the source of Orm's power and destroy it. The miniseries The Atlantis Chronicles suggests that brothers battling for rulership is a recurring theme in Atlantean history. In the series Aquaman: Sword of Atlantis, Ocean Master enslaves the Atlanteans who survived the Spectre's destruction of Atlantis, and is using them to mine industrial materials for the surface world. In The New 52, DC Comics' relaunch of all of its monthly titles and the rebooting of the DC Universe continuity, Ocean Master's origins are once again revised. According to the Atlantean advisor Vulko, the queen of Atlantis, Atlanna, left her first child, Arthur Curry, to live with his father on the surface world, thus protecting him from the effects of Atlantean tyranny. Atlanna is later forced to marry a member of the Atlantean Guard and gives birth to her second child, Orm. Twelve years later, Orm's father is killed and Atlanna dies under unknown circumstances, making Orm the new king. Vulko accuses Orm of killing Atlanna, but fails to produce evidence and flees. When Vulko is later confronted by Arthur (who is searching for Atlantis), he explains his brother's origins and tells him that Arthur is the rightful heir of Atlantis's throne, and therefore, must overthrow Orm. Aquaman, suspected Orm to be the Atlantean that hired Black Manta to steal Aquaman's scepter, which is an Atlantean relic of great power that was taken from the Dead King's tomb. When the Atlantean retrieves the relic, Aquaman believes Orm is in the Atlantean ship and demands that he reveal himself, but the Atlantean ship escapes. Later, Orm is visited by Aquaman to ask if he took the scepter, but Orm says that he did not, saying that if he wanted the relic scepter he would ask Aquaman for it. It is also revealed that Aquaman allowed Orm to remain the king of Atlantis, on the condition that he would not invade the surface world. During the 2012 "Throne of Atlantis" storyline, someone sabotages an aircraft carrier and provokes it into attacking Atlantis. Believing to be under attack from the surface, Orm leads Atlantean soldiers to invade the carrier and then wage war on the surface. 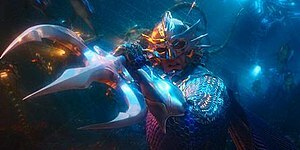 Orm arrives in Boston, attacking seafarers and asking for his brother, Aquaman. Aquaman confronts Orm and attempts to talk sense to him, but they are interrupted by the Justice League without warning. Aquaman defends his brother, refusing to have him face extradition. Attacked on multiple fronts, Orm electrocutes then imprisons the Justice League within water cocoons. He sends the Justice League to the abyssal plain, while he attempts to sink the city of Boston. While Orm and his Atlantean soldiers plant bombs in an attempt to sink the city and face off against the superheroes that Cyborg called in as reserves, they are attacked by a race of sea creatures known as the Trench. After the Justice League escape from the abyssal plain, Aquaman realizes Orm is not using the relic scepter to sink the city. Since the Trench can only be commanded with the relic scepter, someone else must be using it to manipulate the Atlantean war. The mastermind is revealed to be Vulko. The Justice League arrive to battle both the Atlanteans and the Trench, while Aquaman attacks his brother and tries to convince him that Vulko is responsible for the Atlantean war. However, Orm refuses to listen, believing that Aquaman has been corrupted by the surface world. The Justice League manage to dispose of all the bomb detonators in Boston, but Orm tries to use his control helmet to summon a tidal wave. Mera's power turns the wave to hard water to stop it. Orm is defeated by Aquaman, who reclaims the throne and takes command of the deceived Atlantean soldiers. The Trench are returned home and Vulko is taken in for an Atlantean trial. However, Orm is remanded to Belle Reve for his crimes after abdicating the throne and losing political immunity in the process. As he is taken away, Aquaman apologizes to his brother. Afterwards, the renegade Atlantean, Murk, makes plans to break Orm - now known by the media as the "Ocean Master," a name he despises - out of Belle Reve. While in prison, Orm is advised by his lawyer that he must plead guilty to the criminal charges against him. Murk and other Atlanteans arrive to free Orm, but return home when they receive a message that Atlantis is under attack. During the 2013 "Forever Evil" storyline, Deathstorm and Power Ring invade Belle Reve, killing Orm's lawyer. During Belle Reve's prison break, Orm walks out to reclaim his Atlantean garb when a critically wounded prison officer begs for help; seeing that this officer was the only one who showed him any kindness, Orm kills him to end his suffering. He then runs into fellow escapees who are attacking a small-town diner, and whilst he is initially not bothered about confronting them, once they turn their attentions to him, he takes them out. A diner employee named Erin desperately pleads with Orm to save her young son Tommy, but he refuses, instead heading back to the ocean. However, he changes his mind, going back midway through his path to save him. In the aftermath of the attack, Orm now lives with Erin and Tommy, entertaining the latter with stories of Atlantis. Suddenly, Orm is confronted by the king of Xebel, Nereus, who offers him the opportunity to join him to allow the kings of the Seven Seas to rule Earth once more. In the alternate timeline of the 2011 "Flashpoint" storyline, Ocean Master is revealed to have conspired with Artemis and Hippolyta's sister, Penthiselea to start a war between the Atlanteans and the Amazons, during which they would have Aquaman and Wonder Woman killed, in a plot that would eventually see the two conspirators hailed as heroes by the two civilizations for ending the war. In the comics tie-in to the animated television series Young Justice, Orm's double-life as Ocean-Master was confirmed in issue 14. Ocean Master debriefed his Atlantean Purists into terrorizing the impure Atlanteans while Aquaman is away. Before their attack, Ocean Master allayed their fear of Aqualad and told them to be ready nonetheless. When the Atlantean Purists attacked Atlantis, Ocean-Master had Queen Mera at his mercy. Lord Orm appears in the episode "The Enemy Below" of the DC animated universe series Justice League, voiced by Richard Green. This version is a member of the Atlantean royal court. Ocean Master appears in the episode "Evil Under the Sea" of the animated series Batman: The Brave and the Bold, voiced by Wallace Langham. In this series, he's the older brother and hires Black Manta to wipe out Aquaman, Mera and his own nephew, Arthur Jr.
Orm, credited as "Ocean-Master", appears in the Young Justice animated series, voiced by Roger Craig Smith. He is a member of The Light. He is featured in the episodes "Downtime", "Revelation", "Auld Acquaintance", and "Alienated". In season two, he was replaced on the Light by Black Manta. He returns in Young Justice: Outsiders in where he is about to murder the families of the Justice League. It was revealed that Ocean-Master's identity was exposed which led to him being incarcerated in Atlantis for six years and Black Manta replacing him in the Light. Before he can carry out his plan, he is killed by Lady Shiva who would not let a rogue agent mess up the plans of the Light. Patrick Wilson as King Orm Marius / Ocean Master in Aquaman (2018). Orm Marius / Ocean Master made his live-action debut in the 2018 DC Extended Universe film Aquaman, portrayed by actor Patrick Wilson. He is the younger, fully-Atlantean half-brother of Arthur Curry and the second child of Queen Atlanna; Atlanna was thought to have been sacrificed to The Trench years ago for Arthur's illegitimate birth, and Orm blamed Arthur for their mother's alleged death. Orm is introduced in the film as the King of Atlantis who seeks to rule all of the seven undersea kingdoms and declare war on the surface world as retaliation for humanity's centuries-long pollution and exploitation of the ocean.. To this end, Orm hires mercenary David Kane to use a nuclear submarine to attack Atlantis, using the attack as a pretext to provoke an all-out war with the surface. Arthur journeys to Atlantis with Mera in an attempt to avert the war, only for Orm to best Arthur during a gladiator match. As Orm prepares to kill Arthur, Mera interferes and helps the latter escape. Orm then conquers four of the seven underwater kingdoms and declares himself the "Ocean Master" where he had killed the Fisherman King Nico for declining him and persuaded his daughter to side with him. When it came to the Brine Kingdom, Orm nearly killed the Brine King until he was challenged by Arthur with King Atlan's long-lost trident, a weapon that only the true King of Atlantis can wield. He and the Atlanteans are surprised that Aquaman had gained control of Karathen as well as the Trench when breaking up the battles. The two brothers duel once more and Arthur defeats Orm on the surface by breaking his father's trident with Atlan's trident. Arthur spares Orm's life as Atlanna shows up. While Orm is surprised that his mother is alive, Atlanna states that she loves both her sons. Having realized his fault, Orm surrenders and is taken away by the Atlantean soldiers as Nuidis Vulko instructs them to give him a "room with a view." Ocean Master appears in Justice League: The Flashpoint Paradox (2013), voiced by an uncredited James Patrick Stuart. In the altered reality inadvertently created by the Flash, Orm aids his brother Aquaman in the war between the Atlanteans and Wonder Woman's Amazons. The Flash later alters the timeline once more and creates a new reality similar to the original. Ocean Master appears in the post-credits scene of Justice League: War (2014), set in the new reality created at the end of The Flashpoint Paradox, voiced by an uncredited Steven Blum. Ocean Master appears in Justice League: Throne of Atlantis (2015), voiced by Sam Witwer. Outraged by his father's death during the Justice League's battle with Darkseid in War, Orm kills his mother and usurps the throne to become the King of Atlantis and declare war on the surface world. He is defeated by Aquaman and the Justice League. In the post-credits, Ocean Master is shown to be incarcerated at Belle Reve when he is approached by Lex Luthor. Ocean Master appears in Lego DC Comics Super Heroes: Aquaman: Rage of Atlantis, voiced by Trevor Devall. Ocean Master appears in Aquaman: Battle for Atlantis for Xbox and GameCube. Ocean Master appears as a boss in the DS Version of Batman: The Brave and the Bold – The Videogame. Ocean Master appears in DC Universe Online, voiced by Sandy McIlree. Ocean Master is mentioned by Aquaman in Injustice: Gods Among Us. Ocean Master appears as a boss in Scribblenauts Unmasked: A DC Comics Adventure. Ocean Master is referenced in Batman: Arkham Knight. An eatery named "Ocean Master Sushi" can be found in Chinatown. Ocean Master appears as a playable character in DC Unchained. Ocean Master appears as an event character in "DC Legends: Battle for Justice" for the 2018 Aquaman movie. Ocean Master in both normal and gladiator outfit appears as a playable character in Lego DC Super Villains. Several collectibles of Orm in his Ocean Master armor were released in 2018 based on his appearance in the Aquaman film, including a 6' DC Multiverse figure by Mattel and a Pop! Vinyl statue by Funko. ^ Aquaman (Vol. 6) #26. DC Comics. ^ Aquaman vol. 5 #0 (September 2012). DC Comics. ^ Aquaman vol. 5 #11 (July 2012). DC Comics. ^ Aquaman vol. 5 #13 (October 2012). DC Comics. ^ Aquaman vol. 5 #14 (November 2012). DC Comics. ^ Justice League vol. 2 #15 (December 2012). DC Comics. ^ Aquaman vol. 5 #15 (December 2012). DC Comics. ^ Justice League vol. 2 #16 (January 2013). DC Comics. ^ Aquaman vol. 5 #16 (January 2013). DC Comics. ^ Justice League vol. 2 #17 (February 2013). DC Comics. ^ Aquaman vol. 5 #18 (March 2013). DC Comics. ^ Aquaman vol. 5 #19 (May 2013). DC Comics. ^ Aquaman vol. 5 #23 (August 2013). DC Comics. ^ Aquaman vol. 5 #23.2 (September 2013). DC Comics. ^ Aquaman vol. 5 #25 (November 2013). DC Comics. ^ Flashpoint #2 (June 2011). DC Comics. ^ Flashpoint: Deathstroke and the Curse of the Ravager #2 (July 2011). DC Comics. ^ Flashpoint: Emperor Aquaman #3 (August 2011). DC Comics. ^ Fleming, Jr, Mike (December 12, 2016). "Patrick Wilson To Play 'Aquaman's Evil Half-Brother ORM". Deadline Hollywood. Retrieved December 12, 2016. ^ Hibberd, James (June 15, 2018). "Aquaman villain has an eco-warrior motive, Patrick Wilson reveals". EntertainmentWeekly. Retrieved June 15, 2018. ^ "'Aquaman' Movie Toys From Mattel Are Available to Pre-Order Now". Comicbook.com. 2018-10-01. Retrieved 2018-10-18.